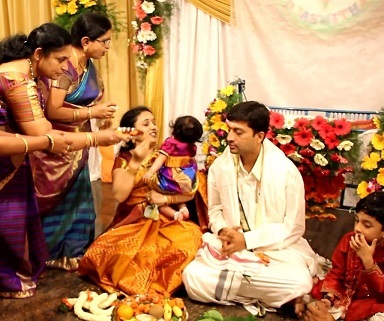 Naamakaranam is the Procedure of naming the newborn baby as per the baby’s Zodiac, time and Star or any suitable name as per the Samprathayam as per their parent’s choice and to receive the blessings of the god. The important Poojas performed are Punyahavachanam and Jathakarmam. On the day of naamakaranam new cloth gifted to the baby and then the mantras are performed by speaking out the name of the baby in its ear. Once the mantras are completed the name tells during the naamakaranam is considered as the official Hindu name and can be used for Sankalpa. It is performed on the 1 day from Baby’s Birth. It is auspicious when performed in the morning.